Second group of families from the Ulpana neighborhood evicted. Police remove one couple by force. 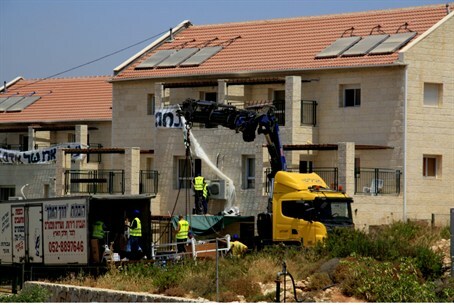 The eviction of the second group of families from the Ulpana neighborhood of Beit El was completed on Thursday evening, after Border Police forces removed from their home Yoel and Yiska Fattal, a couple who refused to leave willingly. The officers arrived and told the Fattals they had to leave their home willing, in accordance with the agreement reached between the Beit El leadership and the government. After the couple refused, the police said they would be forced to remove them from their home in an unpleasant manner. At this point, the officers picked up Yoel and took him out of the house. Meanwhile, police arrested at least eight right-wing extremists who barricaded themselves in one of the Ulpana homes. The second group which was evicted Thursday is mostly made up of older families, which have more children than the ones evicted Tuesday. Therefore they will be receiving "caravillas" with a floor area of 90 square meters, as opposed to the 60 sq. m. caravillas that the first group received. Army Radio reported on Thursday that each of the buildings being moved from the Ulpana neighborhood will be "sawed" into 108 parts, which will be stored in a special storage site. They will then be reassembled at a new location inside Beit El.